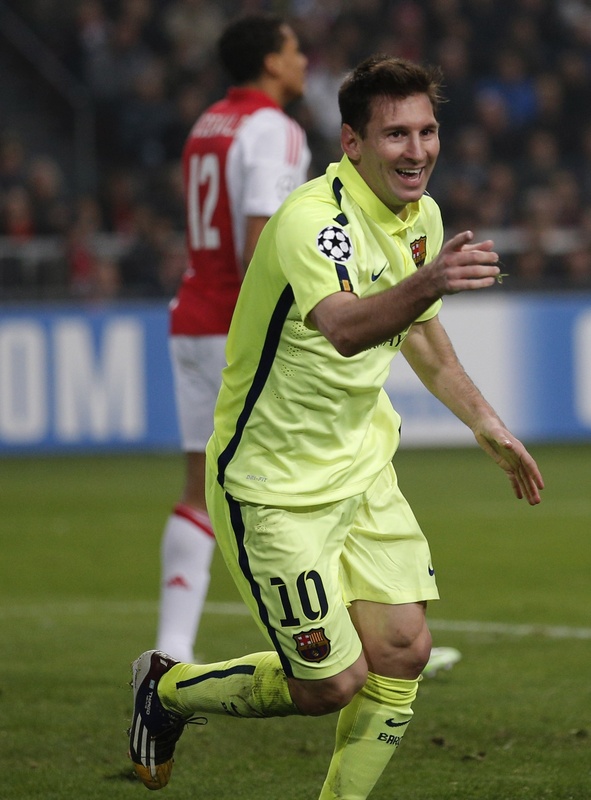 SOCCER: Lionel Messi scored twice to tie Raul Gonzalez’s career record of 71 Champions League goals, and Barcelona won 2-0 at Ajax on Wednesday night to advance to the tournament’s knockout stage for the 11th straight year. The 27-year-old scored with a header in the 36th minute and doubled the lead in the 76th after exchanging passes with Pedro Rodriguez. Messi has played 90 Champions League matches, 52 fewer than Gonzalez. “Messi is absolutely the best player I have ever seen as player or coach,” Barcelona coach Luis Enrique said. Barcelona advanced from Group F along with Paris Saint-Germain, which beat APOEL 1-0 on Edinson Cavani’s goal 57 seconds in. Manchester City finished two players short and lost 2-1 at home to CSKA Moscow. Bayern Munich reached the final 16 for the seventh straight year, winning 2-0 at home against Roma in the other Group E match on goals by Franck Ribery in the 38th and Mario Goetze in the 64th. In Group G, Jasmin Handanovic saved Eden Hazard’s 85th-minute penalty kick, preserving a 1-1 tie for Maribor against visiting Chelsea. Porto advanced from Group H by winning 2-0 at Athletic Bilbao on goals by Jackson Martinez in the 56th and Yacine Brahimi in the 73rd. Luiz Adriano scored a hat trick to help Shakhtar Donetsk to a 5-0 rout of BATE Borisov. NBA: Gordon Hayward made a step-back jumper at the buzzer, one-upping LeBron James and boosting Utah Jazz to a 102-100 victory over the struggling Cleveland Cavaliers in Salt Lake City. Hayward, who had 21 points, broke free of James to catch an inbounds pass, faked a move to the basket and then stepped back on the right wing and swished a 21-foot jump shot as the horn sounded. Derrick Favors had 21 points and 10 rebounds but the Jazz had to overcome a last-minute effort by James, who scored 31 points as Cleveland fell to 1-3. • Grizzlies stay unbeaten: Mike Conley had 24 points and 11 assists, and undefeated Memphis used a strong defensive effort in the third quarter to beat the host Phoenix Suns 102-91. The Grizzlies forced 10 turnovers in the third and turned an 11-point deficit in the second period into a five-point lead going into the fourth. • Spurs beat Hawks again: Tim Duncan had 17 points and 13 rebounds and San Antonio held on to capture its 17th straight win at home over Atlanta, 94-92. The Spurs had a season-high 25 assists for a balanced scoring effort that they needed to fend off the Hawks’ furious rally in the final quarter. • Wizards outlast Pacers: John Wall had seven of his 31 points in overtime, and Washington won its fourth straight and gained a tiny measure of revenge from last season’s playoffs with a 96-94 win over visiting Indiana. • Warriors dominate Clippers: Stephen Curry had 28 points and seven assists, Draymond Green scored a career-high 24 points and Golden State remained unbeaten with its most impressive performance yet, crushing Los Angeles 121-104 in Oakland, California. • Bulls defeat Bucks: Derrick Rose returned from his latest injury and helped Chicago continue to make itself at home in Milwaukee with a 95-86 win over the Bucks. • Lowry, Raptors hold on: Kyle Lowry scored 35 points and had a key steal in the closing minute to lead Toronto to a 110-107 win over the Celtics in Boston. • T-wolves put away Nets: Nikola Pekovic converted a tiebreaking three-point play with 48 seconds left, and Minnesota scored the final nine points of the game to beat Brooklyn 98-91 in New York. • Kings rout Nuggets: DeMarcus Cousins had 30 points and 11 rebounds, Rudy Gay scored 29 and Sacramento beat visiting Denver 131-109 to extend its best start in more than a decade. • Pistons get by Knicks: Greg Monroe had 23 points and 18 rebounds, and host Detroit held off New York 98-95 for its first win of the season. • Hornets end skid: Al Jefferson scored a season-high 28 points and added 10 rebounds, and Charlotte beat visiting Miami 96-89 to snap a 16-game, regular-season losing streak against the Heat. • Magic prevail over Sixers: Tobias Harris made a jumper at the buzzer to give Orlando its first win of the season, a 91-89 victory over the host Philadelphia 76ers. NHL: P.A. Parenteau scored in regulation and added the shootout winner in the Montreal’s 2-1 victory over host Buffalo. Parenteau opened the scoring 19 seconds into the third period with the Canadiens’ first goal in 107 minutes, 1 second. In the third round of the shootout, Parenteau beat Michal Neuvirth with a wrist shot. • Rangers hang on: Derick Brassard scored a power-play goal 1:50 into overtime, after Detroit tied it in the closing seconds of regulation, to give New York a 4-3 victory over the Red Wings. • Tavares, Islanders clip Anaheim in OT: John Tavares scored his second goal on a power play 2:18 into overtime, and the New York Islanders snapped their three-game skid with a 3-2 victory over the injury-depleted Ducks in Anaheim, California. • Pens extend Fleury: The Pittsburgh Penguins have signed goaltender Marc-Andre Fleury to a four-year contract extension worth $23 million. The 29-year-old Fleury was in the final season of a seven-year contract he signed in 2008. • Johnson suspended: Columbus Blue Jackets defenseman Jack Johnson was suspended for three games without pay by the NHL for an illegal check to Carolina forward Jiri Tlusty’s head. TENNIS: Roger Federer, Andy Murray and the Bryan brothers are among the winners of the ATP World Tour Awards. Federer was selected by his peers as winner of the Stefan Edberg sportsmanship award for a 10th time. Murray receives the Arthur Ashe humanitarian award for his involvement in fundraising exhibitions and campaigns. Bob and Mike Bryan take the doubles award for a sixth straight year. • Oudin to undergo procedures: American tennis pro Melanie Oudin said she will have a procedure today for a heart condition, and surgery later this month for an eye problem. • Nadal out of hospital: Rafael Nadal has been released from a Barcelona hospital, two days after undergoing surgery to remove his appendix.